An ancient dramatist can be read in a number of ways. It is possible to read him and thus to infer a dramatic experience in translation, any translation, as if the author were writing today and meant to speak to the issues that we see all about us. This is a valid approach, but it has certain shortcomings, and it may not give all the pleasure that Aeschylus is capable of giving. Conversely, it is possible to read the ancient author, either in the original or in a faithful translation, as if he spoke only to his contemporaries and therefore to no one today. That is assigning him to the basement of the museum. 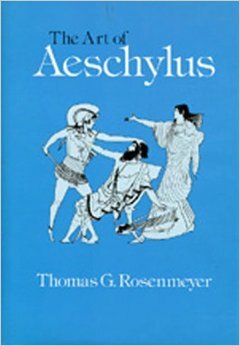 Rosenmeyer is talking about Aeschylus (5th century BC), but the same tension is there for anybody who wants to explain and explore ancient texts –at least, ancient texts that matter. If you shift the topic to Bible interpretation or preaching, you immediately see that there’s a constant choice to be made between letting people think the text is speaking directly to their situation in all its detail on the one hand, or on the other hand telling them it’s not about them at all; it’s the basis for a history lesson about how things used to be. “Between the extremes,” says Rosenmeyer, “my preferences and obligations put me closer to the footing of the historian.” But he writes with an awareness that there are trade-offs, and that by leaning toward the historian’s explanation, he needs to remain vigilant about leaving Aeschylus in “the basement of the museum.” That, after all, is the climate-controlled and dimly lit place where we put dead things to keep them safe from ordinary life, and perhaps to keep ordinary life safe from them.